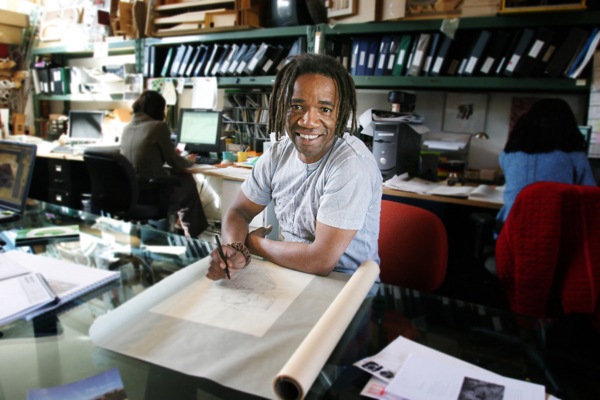 Walter Hood, a Fellow at the American Academy in Rome and a winner selected to represent the United States at the 2010 Venice Biennale, has been selected to create an integrated sculptural work for the Expo Line Downtown Santa Monica Station. Hood is a professor at the University of California, Berkeley, where he was chair of the Landscape Architecture and Environmental Planning Department from 1998 to 2002. He is also the Goldman Sachs Design Fellow for the Smithsonian Institute (Washington, D.C.), where he is assisting with the reconceptualization of the museum’s public spaces. Hood has exhibited his artwork and has created projects at venues that include the Broad Museum, California African American Museum, Oakland Museum of Art, School of the Art Institute of Chicago, De Young Museum, Harvard University, Van Allen Institute, San Jose Public Art Program, Cooper Hewitt National Design Museum, Rice University, California Crafts Museum, and the African American Historical and Cultural Society. He has received the Cooper Hewitt National Design Award for Landscape Design, American Institute of Architects (AIA) Award for Collaborative Achievement, Robert Taylor Fellowship from MIT, USA Character Approved Honor from NBC Universal USA, and was a finalist for the President’s Park South Design Competition with the National Planning Commission. He holds a Master of Fine Arts from The School of the Art Institute of Chicago; both a Master of Landscape Architecture and a Master of Architecture from the University of California, Berkeley and a Bachelor of Science in Landscape Architecture from North Carolina A&T State University. In addition to teaching at the University of California, Berkeley, Hood has taught at Harvard University Graduate School of Design and at the University of Karlshrue (Germany). Hood is one of eight artists commissioned by Metro Creative Services to design original artworks for seven new stations being constructed for the second phase of the Metro Expo Line. Check back often! More information about each of the artists will follow in the coming weeks. WHY does the MTA place such a priority on “artwork” at its transit/light-rail stations, as opposed to getting the damned things OPEN AND FUCNTIONAL FOR RIDER USE? It will be HOW MANY YEARS before the Purple or Expo. Lines get to Santa Monica, and you are already touting “artwork”? WHO CARES? GET THE LIGHT-RAIL STATIONS UP AND RUNNING ALREADY! THEN concentrate on “artwork”, or who could add “artwork” to the OPERATIONAL STATION! @istj04: Seems to me that an “integrated sculptural work” must by definition be installed during–not after–construction. I’m sure most would agree that general construction and testing contribute to the lion’s share of any completion delays. Calm down. So, translate this so-called “integrated sculptural work”, and please explain WHY it must be installed as PART OF the construction process, as opposed to being installed AFTER a transit station is up and running? MTA riders DESERVE to get the transit or light-rail station FUNCTIONING first (so they can actually ride the buses or light-rail they will CATCH at said places! ), and NOT have construction of a transit project SLOWED DOWN due to “integrated sculptural work”.